Do please remember to click to enlarge! Fall finally arrived and cloaked our world in beautiful colors...Please join our host, Dave, The Home Garden and other participants in celebrating the Fall Color project. Edit: Has anyone noticed their comments disappearing? I had a lot of trouble with blogger this weekend and a commenter has told me she knows her comment posted~~then wasn't there later. Warmest thoughts of you all. Stunning, Gail ... you have certainly captured autumn's finest and the beauty of Sandberg's poem. Happy November! Beautiful Gail! I have been so surprised to see how many hickories we have in our area. Now that they are in their full glory they jump out of the landscape! Gorgeous photos! Beautiful photos, Gail! I think the first time I went to Edwin Warner was in the fall. We brought our bikes and dangerous rushed down the winding trails covered with slippery wet leaves. There was is also a slight drop off between paving layers on the edge of the road that was obscured with leaves. It was really harrowing. Another time, "I" blew out DH's knees by going over the mountain on the trail trail all the way to the opposite side of the park and then we had to walk all the way back. DH was so pissed at me that he didn't say a word the whole way back. I can laugh about it now, but I'm not sure if he can. Edwin Warner is full of memories. I would really miss it if I moved. I always think of Lance Armstrong too, do you? I took your advice to enlarge and did. This a fantastic group of pictures. I especially liked the rows of black trunked trees with yellow foliage that were next to and over the road. Yay fall color and yay seeds! It looks the ideal place to enjoy the wonderful colours of Autumn. Superb. What a gorgeous hickory! You were most smart to put that one first as it simply shines! Autumn can be so much fun but have to hurry before the leaves drop. Love your pics...dosen't it feel good to get out this time of year? I love the curved road lined with bright gold. The Shagbark Hickory is simply splendid -- it looks like it glows with a light all its own. Fall is beautiful enough to make me cry. I just love seeing the changing of the seasons and it is so noticeable during fall. These are just gorgeous scenes, Gail! And thank you for the wonderful poem by Sandburg--it's one I don't think I've ever read before. I am "crying" because while I have enjoyed the beautiful fall color we have had, I never took the time to photograph it. Now there are more bare trees than leafy ones. It looks like Tennessee is in its full glory now! Thanks everyone. I am so glad to share the colors that FINALLY arrived. We have mostly gold, but the sugar maples can be counted on to give us a deeper orange and then who doesn't love the dogwoods for a pop of red every now and again! I hope your weekend was filled with beauty. Fall color is so magnificent! I absolutely love your shagbark hickory! Sweetbay, Rose, The shagbark hickories are a real treat here...food for the critters and a joy to see. Lzyjo~~The horse trails at Percy Warner always seemed like great places to ride a mountain bike...But the riders sure hated even walkers to be on their trails. I can see you careening down the hill! When i was there in the rain I was trying to imagine anyone riding on those slippery wet roads! Lisa, Have you been to Tootsies? It is a must go to place for anyone visiting here...Isn't the sign priceless. Beautiful things may not last - but there will always be another beautiful day! -Love your pictures of autumn! Frances, Blogger is often a troll hiding under bridges eating photos, posts and comments! This weekend it ate all my photos 5 different times. Arg! 'Sweet little post'...you are too funny! What was it Maude would say...Oh, yes! "God will get you!" Hi Gail, you are enjoying a beautiful autumn. Ours was a little disappointing but I'm getting a second chance thru the photos on yours and other friend's pages. What vibrant colors, they just pop off the computer! I really love the one on the road through the trees, makes me want to go for a nice drive and see more color around here. Hi Gail! You have captured fall for sure with these marvelous photos. It IS so sad for sure that nothing beautiful lasts. boo hoo to that. Why can't we figure out how to make it stick around longer or would beauty just lose its preciousness if we did? I'm glad Fall arrived for you ~ as for me, you know I am happy when it takes its sweet time. Enjoy your tapestry of colors. Beautiful colors Gail. I would love to ride a bike down the curved road. It just looks like it needs to be explored. Gail, The colors and scenes are stunning. The poem moves so well with the images. Great post. Such beautiful photos and a beautiful poem Gail. I just love the bark on that shagbark! Wish those grew around here. 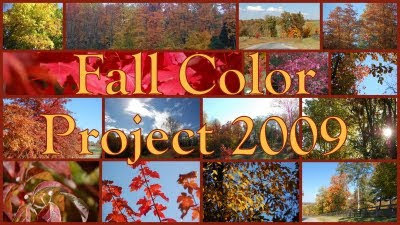 I haven't heard about the Fall Color Project so I will check it out. I haven't had any missing comments but then again, I'm woefully behind on anything blog related so I may not have noticed! Have a great week! Our neighborhood is full of Shagbark Hickory trees and that was one of the things that attracted me to this neighborhood. They can be a bit messy close to the house, so now we don't have as many in our yard. The squirrels like them, too. I enjoyed this autumn tour while reading the Sandberg poem. Very nice. Also, I like the word autumn....has a better sound than fall. Stunning photos! The words you wrote touched my heart! Really beautiful! That shagbark hickory is a stunner. It's at its upper reaches here - never really noticed its colour - probably because it's competing with the maples. Will have a good look this afternoon to see if I can find one of ours to enjoy the wonderful gold. Gail, btw, what kind of witch hazel is that. Kind of fun to have one that blooms in the fall. I can't believe how deep the gold is of the Hickory tree. I can understand your sadness that the autumn show is almost over. But, at least it will come back again next year. Ahhhh, beautifully fitting Gail and I love your 'book bedlam' by the computer. What could be better than that? Gail, Thanks so much for your comment on my Honest Scrap. I do write about my nature spirit experiences on www.jackosplot.com. Do let me know what you think and any questions you might have. Writing about this is still a work in progress for me. I'm not sure hickory trees grow here in the NW - we seem to experience them only in smoke form, in BBQ products. I'm glad to see one growing free and lovely, like yours! Your witch hazel is blooming now, huh? I know someone else (Nestmaker) whose is too, even though winter is more typical. Interesting! Hope Blogger is behaving again, that must be super irritating to have comments disappear. I've enjoyed all your recent posts this morning. Your enthusiasm and humor always leaves me smiling, not to mention the clever way you capture the "visitors" and flowers in your lovely garden. Your photos are wonderful! I'm nuts about the shagbark hickory. It's a flaming beauty right now in my yard. What I do, is read several posts on a blog at a time. Sometimes I comment on more than one, other times I say something about different ones in a comment on just one of them. Then, the next time I come back, I look to see if I've left a comment on one of the more recent posts, where I think I've left off, and a lot of times, I don't have a comment there. I have probably left comments about the same post more than once that way. I love colors at yours and the other place you were. You did have some great fall colors. That was a lovely poem, too. I was going to participate in the fall color project, and still may, but I'll need to find some photos I've already taken, because a lot of the leaves have fallen from the trees. Thanks for your comment on my blooms. I bought the bidens on sale as plants. I wonder if I gathered seeds if they would grow in your garden. I'll have to look and see if there are any, as it was planted in July, and didn't start blooming right away. It is 70 degrees right now, and sunny. I was out gardening, but our grandson, who we have every Saturday, woke up from his nap, and so I had to come in and attend to him. Then, he went back to sleep. I wonder if I can get up yet. Well, it's supposed to be this nice tomorrow, too, only cloudy. I hope this long comment doesn't get gobbled by the blogger gobbler.